Human rights activists worldwide are demanding clemency for cleric Sheikh Nimr al-Nimr, sentenced to death in Saudi Arabia for taking part in Shia Muslim minority protests in 2011. They warn the execution could inflame the whole of the Middle East. In their address they say: "It is a severe blight on the reputation of this office if it is not able to work to protect the rights of individuals to free speech, to protest, to practise their religion, to a fair trial, to not be subjected to torture, and the right to life." Despite global condemnation the forthcoming execution has been largely ignored by Saudi Arabia's key allies - the UK and the US, nations that profess to upholding democratic values. The sentence aroused the strongest condemnation from international human rights watchdogs. 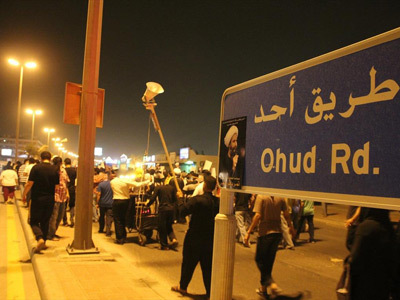 Shia Muslims around the world have been holding rallies and petitioning to prevent the execution. 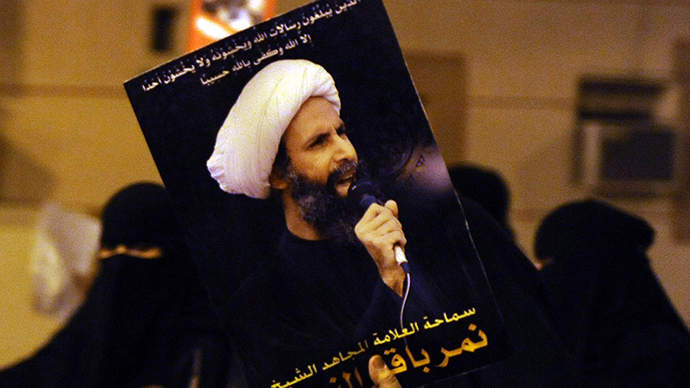 When Saudi Arabia announced al-Nimr will be executed on May 14, protests intensified and people took to the streets in Saudi Arabia, Bahrain, India and Iraq. In Iran, the regional superpower and the only country with a predominantly Shiite population in the Middle East, clerics and scholars staged a mass sit-in on Wednesday in the two holy cities of Qom and Mashhad, to express their solidarity with Sheikh Nimr al-Nimr. 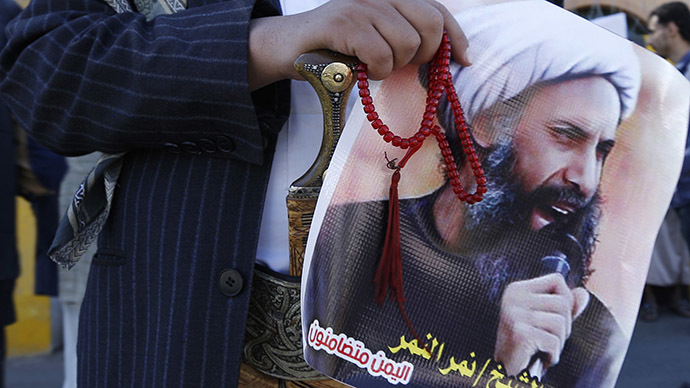 Iranian Shia Muslim clerics warned that Saudi Arabia is going to pay a heavy price if it dares to execute the religious leader, saying the execution could trigger “an earthquake” that would lead to the fall of the Saud dynasty. 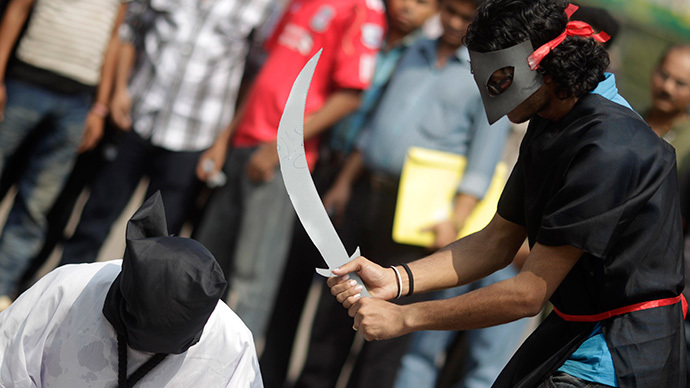 Last week, following the beheading of five foreigners, human rights groups condemned Saudi Arabia for a dramatic increase in public executions. Eighty people have already been executed so far in 2015, compared to 88 during the whole of 2014. 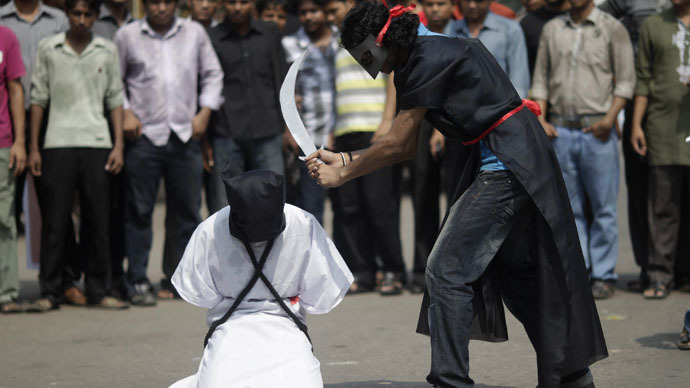 Despite mounting international criticism from foreign governments and human rights campaigners, Saudi Arabia has shown no willingness to end public executions. This is another example of how the international community doesn’t care about human rights in Saudi Arabia, Ali Al-Ahmed, Director of the Institute for Gulf Affairs, told RT. “It really reflects a lack of interest on the part of the international community, especially Western countries who have been calling themselves champions of human rights. The [the West] look at them [Arab world] as unworthy of having human rights and we see international hypocrisy at its peak,” he said.